Happily I’ve already been able do it several times, which means anyone can do it! 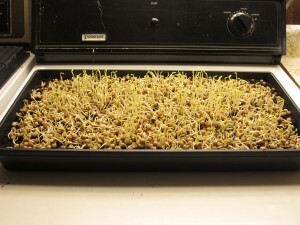 Both sprouts and shoots are grown for their tender and nutritious young seedlings. Sprouts are immature seedlings that are eaten just after seedlings emerge and the cotyledons (first leaves) open up, but before any true leaves appear. (They are not grown in medium, as shoots are.) The most popular types of sprouts are greens and grains, with notable health interest in broccoli or other Brassica crop sprouts. 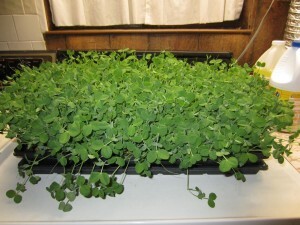 Shoots are similar to micro-greens, being grown in medium and clipped along the stem, and tend to be large seeded crops, like peas and sunflowers. Get a normal 10-20″ flat (and make sure it doesn’t leak – you really don’t need much drainage for this), and fill it with 1 and 1/2″ of growing media. (Really, that’s all you need!) 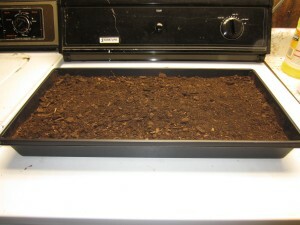 I use a 50-50 mix of LeafGro compost and peat moss, but any decent growing media will do. 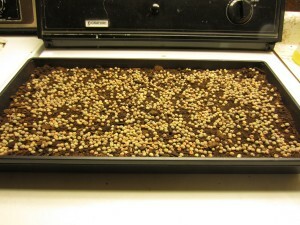 Next, spread about a 1/2 pound, or 1 cup, of seeds as evenly as possible over the surface of the flat. You can use less but I like a nice full flat, just so long as you don’t have the seeds piled on top of each other. Then water thoroughly, and cover with another flat, right side up (as if you were stacking the two flats together). This helps keep the seeds moist, and helps keep the growth even when they start to sprout. Keep it in a dark, cool place and check to make sure they stay moist. 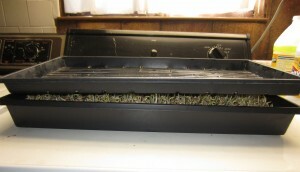 You shouldn’t need to watch too hard to know when the seeds sprout, as they will literally start to push the covering tray up. (I use a shallow covering tray, but a second standard one works fine.) Once they do that, give them another good watering if they need it, then turn the top tray over, so it’s upside down. That will again help keep the growth more uniform. Keep stored in that dark, cool space. Once they start to push up the overtuned top flat – this should be at roughly 7-10 days – you can take it off and put the tray next to a window. Then just keep ‘em watered and watch ‘em grow for a few more days, and by two weeks you should have an absolutely lush flat of luscious, highly nutritious greens, perfect for your winter salads – it’s that simple!! Recently we have been experimenting using Sweetwater LLC’s Bud Booster Water Filter which claims to enhance the growth of flowering plants by eliminating chloramine and fluoride. We have certainly noticed a difference so we are now considering investing in more of these systems. The combination pictured below is my new favorite salad: fresh (cut ‘em 10 minutes before you eat ‘em!) pea shoots with chopped up local apple or pear, some chopped up pecans or other nuts, and crumbled blue cheese. Delish! And served here with garden sweet potatoes out of cold storage and some local snausage. Yum!!! 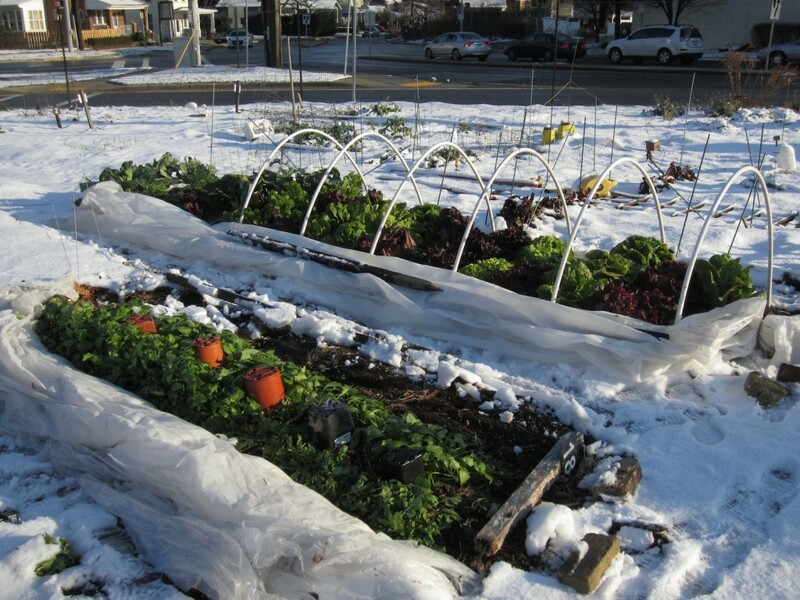 Who the heck says you can’t grow veggies in the dead of winter? Well technically it’s still fall (hard to believe), but it sure feels and looks like winter out there, including frigid arctic temperatures and snowfall. 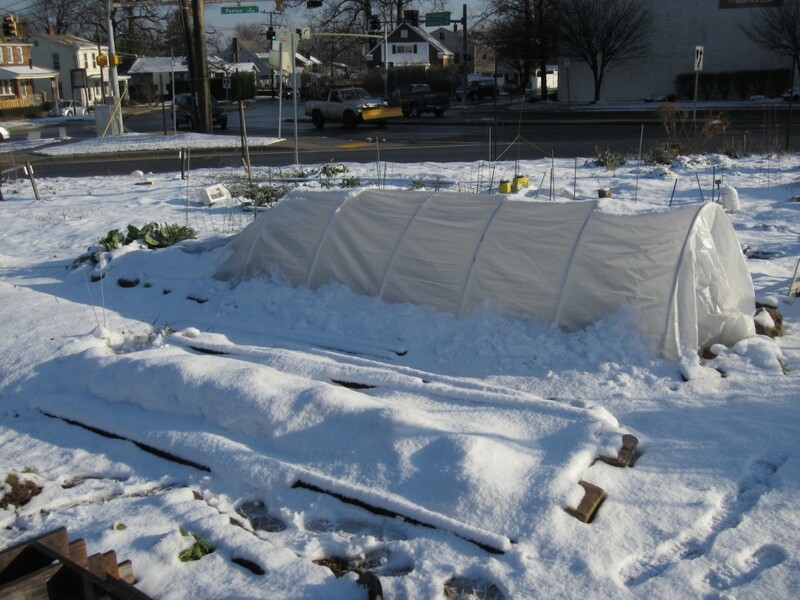 But with a sturdy low tunnel you can grow veggies well into the cold weather, as this series of photos from my winter salad garden demonstrates! “Under the hood” in the main low tunnel I’ve got several kinds of green and red lettuce (including Red and Green Romaine, Salad Bowl, Red Velvet, Buttercrunch and Green Oakleaf), mustard greens, Swiss chard, kale, broccoli and mizuna, and in the smaller covered plot in the foreground I have arugula and white turnips (good for the greens as well as their sweet roots). 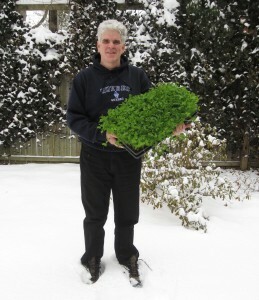 You can do this too, and nothing makes friends happier than a fresh garden salad in the middle of winter. 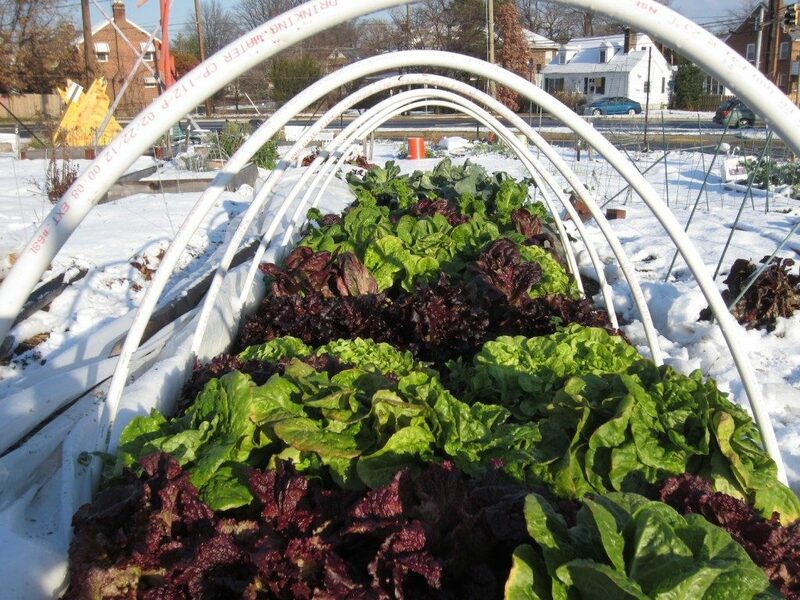 Start planning for your 2017 winter garden now… and look for MVG winter gardening and low tunnel construction classes this coming summer! The School Food Forum – November 2! We are delighted to announce that Montgomery County’s first-ever School Food Forum, “Creating a Vision of Fresh, Real Food in Montgomery County Public Schools,” will be held Saturday, November 2, 9:30am – 2pm at Lutheran Church of St. Andrew, 15300 New Hampshire Ave in Silver Spring, MD 20905. Montgomery Victory Gardens is co-hosting this event with Real Food for Kids – Montgomery. If you care about school food and nutrition for kids, food education, and the welfare of local farms and agriculture, you won’t want to miss this program, as it brings together a large collection of expertise and experience on this issue, from a local to a national level. Our keynote speaker is nationally known school food reformer Tony Geraci, former Food Director at Baltimore City Schools, current Director of Nutrition Services at Shelby County Schools in Memphis, and subject of the documentary film “Cafeteria Man.” Additional speakers include Marla Caplon, Director of MCPS Food and Nutrition Services, Lisa Lefferts of Center for Science in the Public Interest, Kathy Lawrence of School Food FOCUS, and members of the Montgomery County Council. As you can see, you won’t want to miss this Forum!! The $25 ticket ($15 students) includes delicious, nutritious locally-sourced lunch from La Prima Catering. (Scholarships are available.) Seats are limited, so register now! Will 2014 be a decisive year for GMOs? Will 2014 be a decisive year in the drive for – or against – genetically modified foods? The issue has been heating up for the past few years, and new developments are now coming fast and furious. The insanity hardly stops here, though. It was reported just yesterday that the Supreme Court has dismissed the case of organic farmers who sued Monsanto over its strong arm tactics to protect its patents on GMO seeds, which include suing farmers whose crops have been contaminated by GMO crops for “patent infringement.” And the latest word from national food groups including The Cornucopia Institute and Food Democracy Now! is that Monsanto is quietly pursuing legislation in Congress to create a federal GMO labeling law – although one that would be only voluntary, and which is in the eyes of many an end-around attempt to quash various state campaigns for GMO labeling. But there are victories on the other side as well. 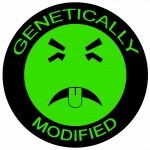 In spite of the narrow losses of GMO labeling initiatives in California and Washington – losses that came only after multi-million dollar industry disinformation campaigns.Connecticut recently became the first state to pass a GMO labeling law, and Maine just became the second. Kellogg’s has decided that Cheerio’s will go GMO-free in 2014. National supermarket chain Whole Foods announced last year that they will institute their own GMO labeling program, and this past fall a federal judge in Mexico ruled that planting of GMO corn in that country had to stop until lawsuits challenging it could be heard. (Joining, at least temporarily, the 64 countries around the world that either ban the use of GMO crops or require labeling for products containing them.) Some are also suggesting that the industry attempt to get a voluntary federal labeling law is a sign of how concerned they are about the various state efforts in the U.S. (including one that will be starting soon in Maryland). This battle over the future of our food, and who controls it, will only intensify in the coming months. Do you want to stay up on all the developments, including the soon-to-be-announced Maryland campaign? 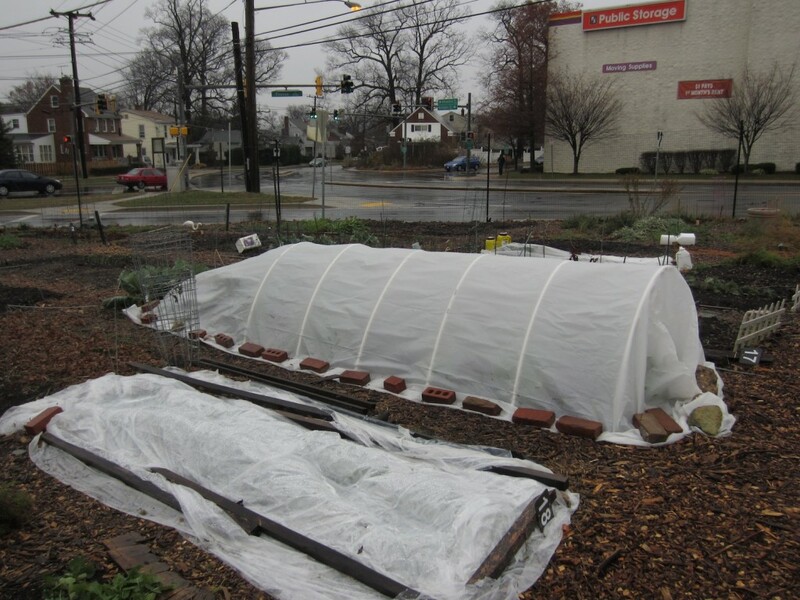 Then make sure to sign up for Montgomery Victory Gardens’ monthly emal update, and visit (and like!) our Facebook page. And don’t forget – as we work toward labeling and similar efforts, you can avoid GMOs by buying certified organic, which doesn’t allow GMOs, by purchasing from farmers you know… or by growing it yourself! David Heisler leading the squash blossom tour. was used during the conference. I was encouraged to hear he is on the Montgomery County Agricultural Advisory Committee, and that his guidance and ideas are increasingly sought after. David, how long have you been farming in Montgomery County? I grew up In Boyd’s, Maryland on a Dairy Farm. My extended family was a mix of farmers and white-collar workers. The town of Boyd was known as a “Friendly Farm Community” back then. Not sure how long I’ve been “farming,” exactly. Being born within a farm family in a farm community…. your knowledge base starts pretty early. My Grandfather Harvel let me pick a ripe peach off a tree when I was five years old. I was with my Grandfather Heisler checking on his Honeybee’s at the age of six. 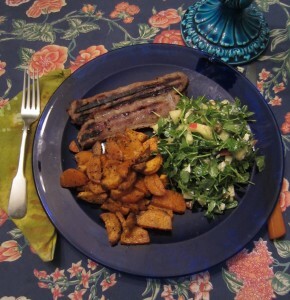 What made you decide to specialize in winter squash? Can’t say it was any particular decision on my part. More of an evolution. But I will say that winter squash is a type of “super-food”: very tasty, very nutritious and it comes in its own container so it can last for months without special storage. I was mightily pleased to hear you use the word “biodiversity” at the Farming at Metro’s Edge conference earlier this year. What does biodiversity mean to you, and why is it so important on the farm? When I’ve heard you speak, you place a very special emphasis on pollinators, and in particular bees, and we certainly saw swarms of them during the squash blossom tour. Why are they so important to you, and what do you do to support bees and other pollinators in your farming practices? Pollinators play a huge role! They are the work force of Mother Nature. They are the little engines thatHeisler – butterfly connect the blossoms of male and female plants, allowing them to reproduce. Whether one is a hunter-gatherer or farmer it is this bounty we harvest. Apples, peaches, pumpkins, and squash are examples of fruits pollinated by bees. There are also legumes and herbs, trees, shrubs and wildflowers. These require bees to allow their reproduction but also support the harvest of nectar for honey and food sources for other insects and animals. All playing some roll in Mother Nature’s game of chess. On our tour you said, “to observe something you have to move slower than it does.” Can you tell us your philosophy and practice of observation on the farm? Stop and watch! Observations and taking notes should include all your senses and all the seasons. Try not to don’t jump to conclusions about those observations or you’ll spend a lifetime changing your mind. I’ve noticed that while you are incredibly attuned to insects and animals and using natural practices when you farm, you are not certified organic. Why not? Just doesn’t work for me. “Certified Organic” is too limited in nature for me. (Pun intended) I’m biased but I think our landscape would be better off if stores in the D.C. Metro area stocked my produce instead of “Certified Organic” from CA or Mexico. There is a large and growing public concern about the widespread use of pesticides and herbicides in agriculture, and their effect on both human and environmental health – and in particular their effect on pollinators, given evidence that some pesticides might be implicated in the dramatic decrease in bee populations known as “Colony Collapse Disorder.” What precautions do you take when using any pesticides or herbicides? And what would you say to reassure food-lovers who are concerned about any use of these chemicals on their food? This is a confusing area for a lot of consumers, with a lot of misinformation out there. “Pesticide” is a general term for a class of inputs. Insecticides, herbicides, and fungicides are all Pesticides. Certified Organic growers can and will use pesticides on there crops. An organic insecticide may be extracted from a plant verses a man made chemical version which would not be considered organic. To the insect the poison is the same, it kills. The man made version may have benefits to a farmer an organic version may not. Ease of use, safety, storage, price, effectiveness and post harvest interval are just a few things that can play a roll in the decision to use one type of pesticide over another. 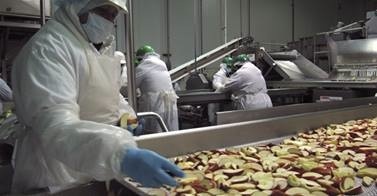 Any pesticide can have unintended negative effects on a worker or the environment or even the produce if misused. My pumpkins and squash have been grown free of insecticide use for five years now. (A few of David’s young acorn squashes, with blossoms, at right.) I use cover crops to improve soil nutrition. If I need to add any nutrients, N, P, K. or a micro nutrient like Boron I’ll apply it to my cover crop and let the cover crop release it back to my cash crop later. Because of my “Chess Board” approach no wide spread use of any input is required. As for the protection of honeybees and colony collapse disorder, my take is that it is not limited to pesticide use. My experiences tell me different combinations of factors that cause similar symptoms may cause Colony Collapse Disorder – and the biggest single factor for our decline of bees, birds, butterflies and other beneficial insects is habitat loss. Every single one of us has played a part in this. For the most part unknowingly. Most of you can reverse that too. Here’s how: let a flowerbed just go, or a back section of your yard! (Meaning grow on it’s own, no weeding or watering.) Let it grow! Don’t mow. Thru the course of a year walk out to that patch and stop and watch. Over time you’ll hopefully observe some of wonders of bio-diversity you’ve been missing. There’s no question that you grow winter squash for food as opposed to holiday ornaments, and they’re some of the best tasting squash around. What varieties do you grow? I grow about forty varieties. They all have their own uniqueness in color, texture, flavor and sweetness. Size can be a factor for consumers since some delicious pumpkins are so large. I grow several Acorn Squash Varieties that are small enough to use whole or halved and be of a convenient serving size. Any favorite recipe you want to share? It is unfortunate that the current House of Representatives seems determined to slash food and nutrition programs for those in need. To the degree that a budget is a moral blueprint, they are proposing an astoundingly unconscionable way to balance that budget, taking food out of the mouths of hungry people. Currently the House is trying to cut $40 BILLION from food programs for the hungry in our country, and several groups have joined to together to orchestrate a National Call-In Day. Contact us for a toll free call-in number and talking points from Feeding America – and thanks for making the call, for the millions who go hungry in our country each day. 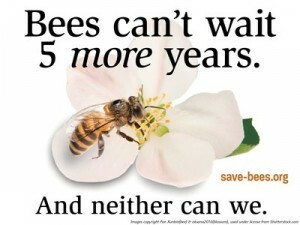 Take Action to Save the Bees – Now! While it has been too little in the news, readers of MVG updates and the posts of other food and environmental organizations realize that bees are in grave danger, suffering from a combination of threats including a mysterious malady known as Colony Collapse Disorder, or CCD, which this past winter caused many beekeepers to lose 50% of more of their hives. The gravity of this issue cannot be overstated: bees are a foundation of the natural world, responsible for pollinating countless plants including more than 1/3 of all the food we eat. Here’s an action you can take now to help save the bees. It is likely that CCD has multiple causes, but increasing attention is being paid to the role of pesiticides, including a class of pesticides knowns as neonicotinoids – among the most widely used in the world. Based on scientific evidence the European Union restricted the use of several “neonics” this year, but here in the U.S. the EPA says it may take until 2018 – five years from now – before it can make a decision. This is unacceptable. As stated in this full page ad published today (the start date of the EU’s restriction) in the NY Times and other newspapers, the bees can’t wait five more years – and neither can we. The coalition behind this ad, which includes the Center for Food Safety, Pesticide Action Network and others (including Friends of the Earth, whose additional action you can find on our advocacy page) has started an online petition demanding action from the EPA. Please sign this petition today – and then pass it on to your friends. One last note – another primary threat to bees is loss of habitat and food sources, from the monocropping of industrial agriculture to the spread of lawn-dominated residential communities. This coming year, one of the best things you can do for bees and all pollinators is to give them more food – by planting bee-friendly flowering plants, and/or simply letting the plants you do grow flower. (Bees love flowering basil, for instance.) Let a thousand flowers bloom – for the bees, and for our future!